^ Oliphant, Roland; Rothwell, James. Russian ambassador to Turkey Andrey Karlov shot dead by police officer in Ankara who shouted 'Aleppo, revenge'. The Telegraph. 2016-12-19 [2016-12-19]. ^ What Gun Was Used to Assassinate the Russia’s Ambassador to Turkey?. thefirearmblog.com. [2016-12-21]. ^ Russian Ambassador to Turkey Killed in Shooting. 美國之音. 2016-12-19. ^ Walker, Shaun; Shaheen, Kareem; Chulov, Martin. Russian ambassador to Turkey killed in Ankara shooting. The Guardian. 2016-12-19. ^ Russian ambassador shot dead in Ankara gallery. 2016-12-19 –通过Reuters. ^ 7.0 7.1 Gumrukcu, Tuvan; Butler, Daren. Russian ambassador gunned down in Ankara, Russian agency says killed. Reuters. 2016-12-19. 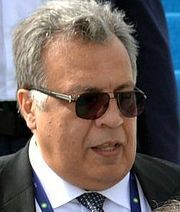 ^ 9.0 9.1 9.2 9.3 9.4 Russian ambassador to Turkey Andrei Karlov shot dead in Ankara. BBC News. 2016-12-19 [2016-12-05] （英国英语）. ^ Turkey talking to Russia on ceasefire, evacuation from Syria's Aleppo. ^ Russia, Iran and Turkey to hold Syria talks in Moscow on Tuesday. 2016-12-19 –通过Reuters. ^ Syria talks between Iran, Turkey, and Russia will still go on in Moscow despite ambassador's assassination. ^ Turkish police officer, invoking Aleppo, guns down Russian ambassador in Ankara. ^ Fisher, Max. Turkey, Russia and an Assassination: The Swirling Crises, Explained. The New York Times. 2016-12-19 [2016-12-19]. ^ Kemp, Ted. Any number of groups could have wanted Russian ambassador dead. CNBC. 2016-12-19. ^ Steinbuch, Yaron. Russian ambassador to Turkey killed in targeted attack. New York Post. 2016-12-19. ^ Kentish, Ben. Russian MP blames Nato conspiracy for killing of ambassador in Turkey. The Independent. 2016-12-19. ^ sitesi, milliyet.com.tr Türkiye'nin lider haber. Erdoğan resmen açıkladı: Suikastçı FETÖ mensubu. MİLLİYET HABER - TÜRKİYE'NİN HABER SİTESİ. [2016-12-21]. ^ 20.0 20.1 Who was the Ankara assassin?. ABC News. 2016-12-20 （澳大利亚英语）. ^ Prince, S.J. ISIS ‘Celebrates’ Assassination of Russian Ambassador to Turkey Andrei Karlov. Heavy.com. 2016-12-19. ^ Mevlut Mert Altintas: The policeman accused of killing Russian ambassador Andrey Karlov?. The Daily Telegraph. 2016-12-20. ^ 23.0 23.1 23.2 CNN, Catherine E. Shoichet and Nick Thompson. Russia's ambassador to Turkey assassinated in Ankara. CNN. [2016-12-19]. ^ Shoichet, Catherine E.; Thompson, Nick; Grinberg, Emanuella. Gunman shouted 'Do not forget Aleppo!' as he shot ambassador. CNN. [2016-12-20]. ^ Turkey: Russia's ambassador in Ankara killed in shooting attack by police officer. Haaretz. Reuters and the Associated Press. [2016-12-19]. ^ Russian ambassador to Turkey dead: Andrey Karlov dies after being shot in Ankara. The Independent. 2016-12-19. ^ Umar, Farooq; King, Laura. Off-duty police officer identified in fatal shooting of Russia's ambassador to Turkey. Sun-Sentinel. 2016-12-19 [2016-12-19]. ^ Who was Andrey Karlov? What we know about the Russian ambassador to Turkey. The Telegraph. [2016-12-19]. ^ Четвертый на посту: посол России в Турции Андрей Карлов [Fourth in the line of duty: Russian Ambassador Andrei Karlov killed in Turkey]. Lenta.ru. 2016-12-20 [2016-12-20]. ^ Bromwich, Jonah Engel. Who Was Andrey Karlov, the Russian Ambassador Killed in Turkey?. The New York Times. 2016-12-19 [2016-12-20]. ^ Gumrukcu, Tuvan. Russian envoy's killer remembered as lonely boy, not angry jihadist. Reuters. 2016-12-23. ^ El Gumrukcu, Tuvan (23 December 2016).. Reuters. ^ El asesino de Andrei Karlov, un policía turco de 22 años. La Gaceta. 2016-12-19 [2016-12-19]. ^ Russian ambassador's assassin 'guarded Recep Tayyip Erdogan'. The Telegraph. 2016-12-21 [2016-12-24]. ^ Karlov's assassin stayed in hotel close to scene, took 11 shots. Hürriyet Daily News. 2016-12-20 [2016-12-20]. ^ Statement of the MFA of the Czech Republic on the Assassination of Russian Ambassador to Turkey. 捷克共和国外交部. 2016-12-19 [2016-12-19]. ^ The Assassination of Russian Ambassador to Turkey Andrey Karlov. U.S. Department of State. [2016-12-20]. （原始内容存档于2016-12-20）. ^ ISIS ‘Celebrates’ Assassination of Russian Ambassador to Turkey Andrei Karlov. Heavy.com. 2016-12-19. ^ ISIS ‘Celebrates’ Assassination of Russian Ambassador to Turkey Andrei Karlov. 俄通社-塔斯社. 2016-12-21. ^ Qatari journalist posts: Russia ‘deserved’ ambassador killing for its ‘crimes’ in Syria. The Independent. [2016-12-21]. ^ Gersh, Kuntzman. Assassination of Russian Ambassador Andrei Karlov was not terrorism, but retribution for Vladimir Putin’s war crimes. New York Daily News. [2016-12-20]. ^ Pfeiffer, Alex. NY Daily News Columnist Defends Assassination Of Russian Ambassador. [2016-12-23]. ^ Russian Foreign Ministry demands apology from NY Daily News – spokesperson. RT. [2016-12-23]. ^ Ukrainian MP calls Russian ambassador’s killer ‘a hero,’ FB reacts with outrage. RT. [2016-12-20]. ^ Ukrainian MP branded 'TWISTED' after calling Russian ambassador's assassin 'a HERO. Daily Express. [2016-12-20]. ^ Pamuk, Humeyra; Toksabay, Ece; Dolan, David. Turkey's Erdogan says Putin agrees shooting of ambassador was provocation. Reuters. 2016-12-19 [2016-12-19]. ^ Turkish MFA says won't allow killing of ambassador 'cast shadow' over Turkish-Russian friendship. DailySabah. ^ Turkish police detain six after Russian ambassador shot dead. Reuters. 2016-12-20 [2016-12-20]. ^ 49.0 49.1 Russian ambassador to Turkey assassinated in Ankara by off-duty police officer. Washington Post. [2016-12-19]. ^ Osborn, Andrew; Pomeroy, Robin. Putin says ambassador murder is ploy to wreck Syrian peace process. Reuters. 2016-12-19 [2016-12-19]. ^ Kerry denounces assassination of Russian ambassador. Politico. 2016-12-19 [2016-12-26]. ^ Donald Trump Condemns ‘Radical Islamic Terrorist’ Attacks in Berlin, Turkey. Breitbart. 2016-12-19 [2016-12-26].